There are those people who, when you meet them, you immediately know that they're someone who has your back and is just super cool. Molly is one of those people. She's also a ridiculously talented woman - she's used her many, many skills to help organizations share their stories about fighting human and animal trafficking and their battle for animal conversation. If you're curious to see her amazing work, check it out here! Disclaimer: To be honest, when I had this idea, I didn't really know what it was going to be in the end. I had the general idea of a shadow box, and of course did my due diligence and poked around on Pinterest, but the final product was more of a hazy idea of an idea than a direct, clear goal. So some of the stuff below didn't really help the final product, but you can use them to make it your own way, which is what I want you do to anyway, so... win-win? Step 10: Finish it after your friend has left so you end up mailing it to her + Free Template! 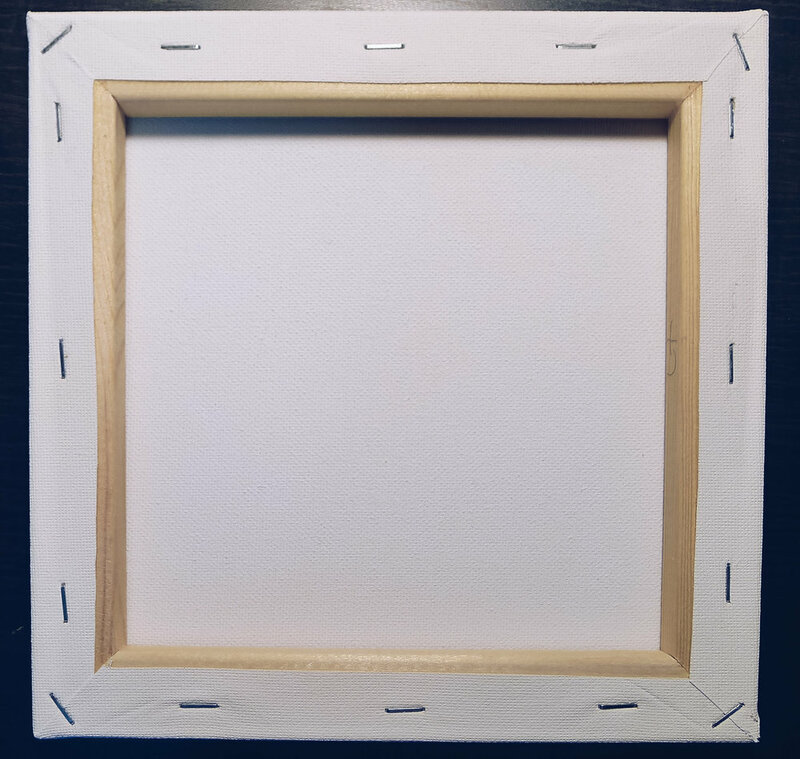 Sidebar: Why a canvas frame and not a picture frame? I took this picture after I started the project so... many things aren't pictured. Sorry. The total cost for this whole project around 20 USD (around 600 THB), not counting what was not shown. I also had a lot of the tools already. I also had my housemate steal the stapler from her work, but shhhh don't tell anybody. For those of you in Bangkok, I got all of this in the art section of the Emporium department store. Basically, flip the canvas over and wedge the end of the flathead screwdriver under the staple and pull up. You might need a small pair of round nose pliers (needle nose pliers should work too, but this is what I had) to pull the staple out the final millimeter. Repeat. If you're wondering why the canvas frame: The reason I used the canvas frame as opposed to a picture frame is because of size and weight. Initially I wanted to give this to Molly before she left Bangkok. Those who have ever moved know that the things that you get around the time you’re about to leave are subject to be left behind simply because there isn’t any space left in your suitcase to fit it. A canvas frame is similar to a picture frame, but lighter, thinner, and bonus: cheaper (there’s no glass). So if I were to make a goodbye present, using a canvas frame is the best bet in having her take it back with her. In the end I ended up mailing it, but that's besides the point. And hey... cheaper postage! 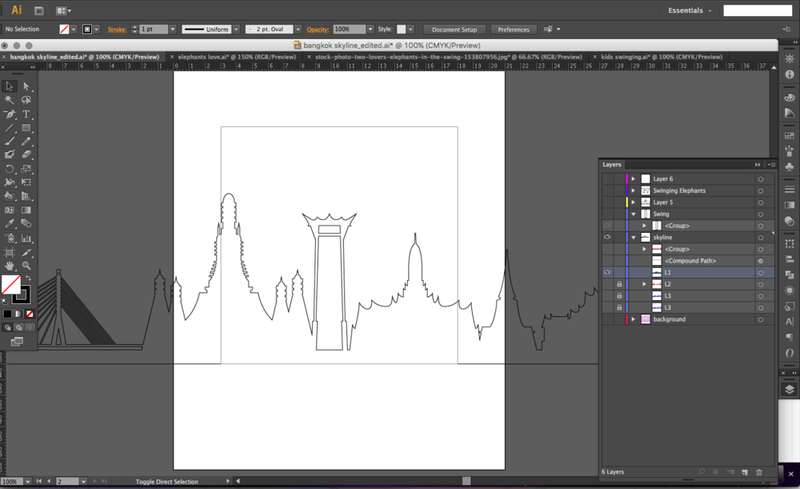 There are two ways to do this: draw the skyline yourself or, the way I went about it, find it online and mess with the file. I was fortunate enough to find the Bangkok skyline vector for free at Vecteezy. From there, I opened it in Illustrator and started composing the layers to fit within the square I drew in the program that was the same size as the opening in the frame. Print them out 1:1 – and make sure to double check that it’s right by lining up the corners of the printed box to the opening in the frame. If it’s a little off, it’ll be fine – just expand the silhouette a little bit farther out when you cut it. 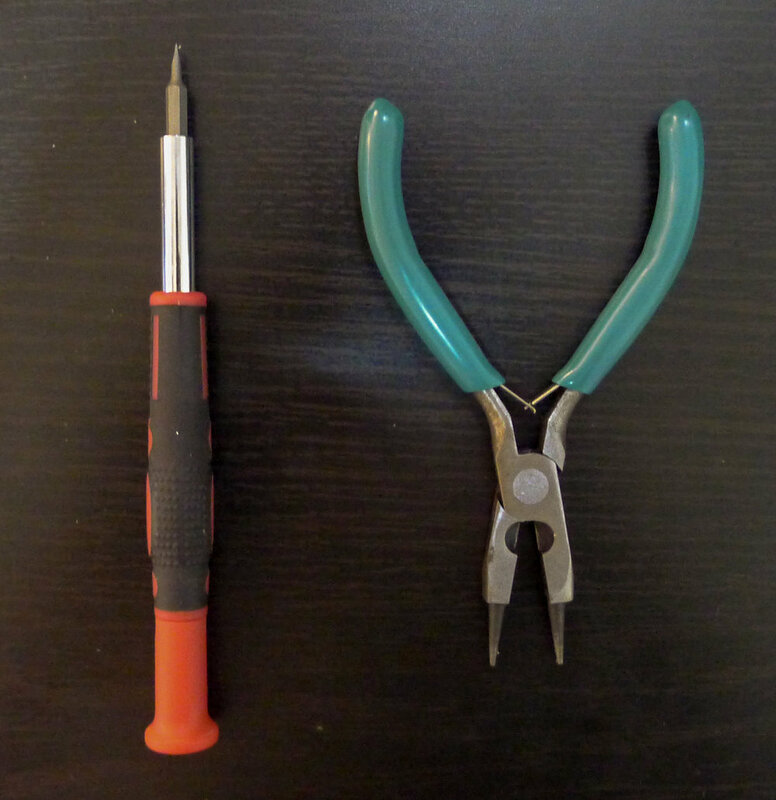 Use an X-acto knife (hobby knife) or scissors to cut them out. I prefer an X-acto over scissors since it’s easier to control around tight corners and tiny changes in the line. You can also use a boxcutter, if you don’t have one. Also, if you like cutting straight lines the way they're supposed to be, i.e. straight, (I definitely do), use a metal ruler to guide the knife. Thank you years of model making in studio! Using the paper as a template, either create a more sturdy and lasting template for each layer by making it in the transparency film or you can just trace them directly onto the watercolor paper. I made the transparency stencils because I didn't know if I wanted to make this again. Also, I was kind of winging it at this point. So, it's a shadow box, you can't see any color, right? Yes... if you choose an opaque paper to cover the front. But I wanted something that could also work under low-light indoor conditions, so I went with a more translucent paper. I’m happy that I did paint them since, under the right light, the pop of color is a nice surprise. You'll see in step 9. I bought watercolor pencils and water soluble oil pastels mainly because I didn’t already own watercolors and I liked how I could (probably) control the color better compared to traditional watercolors. My past experience with watercolors was probably in elementary school where the paper becomes a colorful, yet watery mess, and the paper is oversaturated, making the paper dry all warped. For this project I was trying to fake some semblance of watercolor skill. After trying the water-soluble oil pastels and the colored pencils, I settled on the pencils because of how vibrant the color was when it dried. I ended up going with a sunrise-esque color scheme where it started at yellow at the bottom, transitions through red and orange, and ends with purple at the top. Once you’re satisfied with the composition, cut out the layers from the watercolor paper. Line up the layers and see how they all look together! Once you’re happy with what you have, use your hot glue gun to carefully place a dot on each corner of the paper. I forgot to take pictures at this step, but you're smart, you got this. 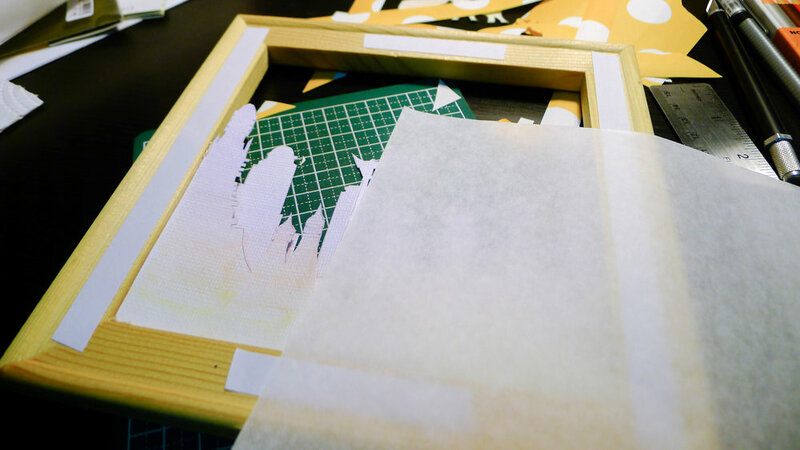 Cut out a square from the tracing paper that’s the same size as the interior edge of the frame. (Just next to where the frame starts to curve out.) and put a light behind it. Like it? I hope so, because there really isn’t anything you can do other than start over if you want to fix something. Sorry. This was the part where I kind of had a spontaneous idea and went off my initial idea. Originally the elephants were going to be another layer of watercolor paper and then everything would be covered. Somehow I thought to move them to the frame layer so no matter the light situation there is some visual interest. First put the tracing paper on with double sided tape. Then cut out the frame from some colorful paper. I used wrapping paper. It’s up to you the way to cut it – I chose to angle the ends of the sides to mimic the wood frame underneath. To protect the artwork inside from the front and the back, cut 2 squares of transparency film the same size of the interior edge of the frame. Front the front, I added small dots of hot glue to each of the corners and then use the raised edges as a guide to align it. For the back, I just used the stapler to fasten the film. So, I forgot to take pictures for this part. (Sorry again.) You'll see it in the final shots if you look closely. Optional: Add triangle picture hangers to the back so you can hang it! I hope you'll want to try this yourself! And to help you, I’ve made a base template that you can download below. If you need help making a city skyline or have any questions about the project, leave a comment below or message me through my contact page. I'd love to hear from you! *Originally I wanted to include the layers I used for Bangkok and a few other cities so you could easily customize and make one yourself, but after looking at the artists' copyright, I can't include the layers in my file. I want to respect the artist's hard work, so I have to do it this way. Also, if you skipped the part (step 3 actually) where I Googled Illustrator alternatives for you, here's a list of some free alternatives. I don't expect you (nor necessarily want you) to follow my DIY exactly. 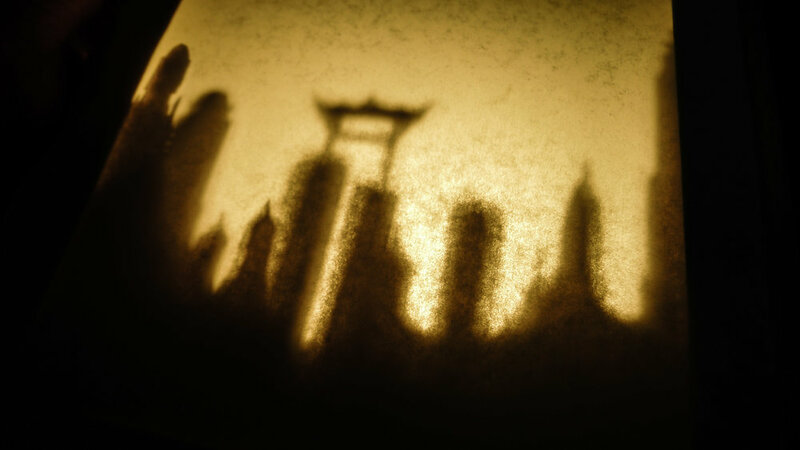 Because the idea behind this blog is to create inspiration, here are some other projects and images that can take what I showed you here and push your shadow box to another level. 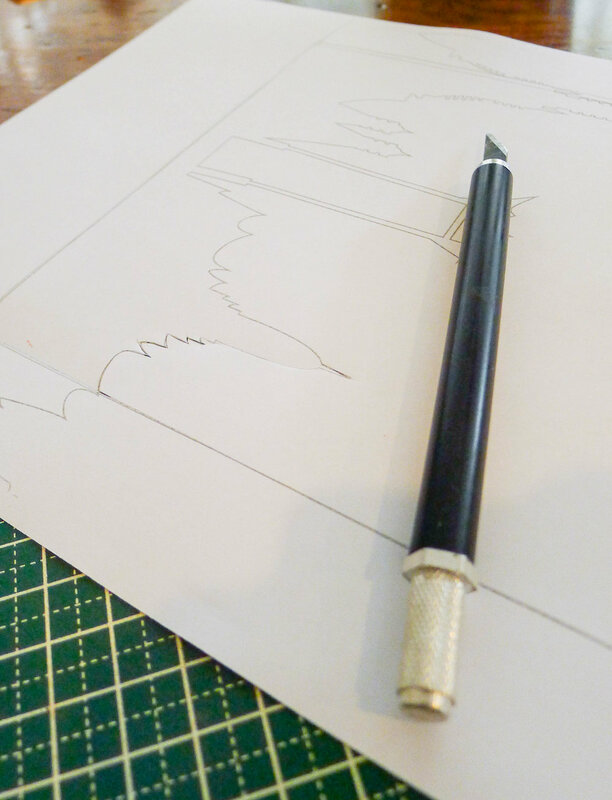 In fact, while finding these pins, I realized what could be really cool is to create a design on the tracing paper, something that works by itself, but when the light comes through, it gains another level of meaning because of the layers hidden beneath it!